At its core sits a reliable and powerful 2.5-liter 700 HP Rezvani built racing engine, and given an innovative and efficient Turbo charger. Rezvani builds the engine from the ground up using new Carillo racing forged pistons, rods, cams, valve, springs and Cosworth ECU. The results are astonishing performance — Beast is capable of 0-60 mph in just 2.9seconds, giving drivers the ultimate thrill. The engine also allows for a low cost of ownership and service. With a removable targa-style top, the Beast Alpha allows drivers to experience open-air driving pleasure without having to sacrifice usability. Trademark SideWinder doors provide a unique experience unlike any other. Even more available room when entering and exiting, and a design that's sure to turn some heads in the process. Ergonomically designed seats with just the right amount of padding and optional carbon fiber fitments provide maximum comfort for hours of driving. A close ratio 6-speed manual transmission provides accurate gear shifts and allows the driver to be fully involved in the driving experience. Available optional sequential automatic. Utilizing the latest in lighting technology, our advanced LED Headlights provide maximum road illumination for late night driving. Uniquely positioned dual exhaust tips provide a muscular and exhilarating exhaust note that can be heard for miles. A programmable dash displays all the critical information for the driver at a glance. Shift lights and shift points are pre programmed to tell the driver when to shift for maximum engine horsepower and torque bans. 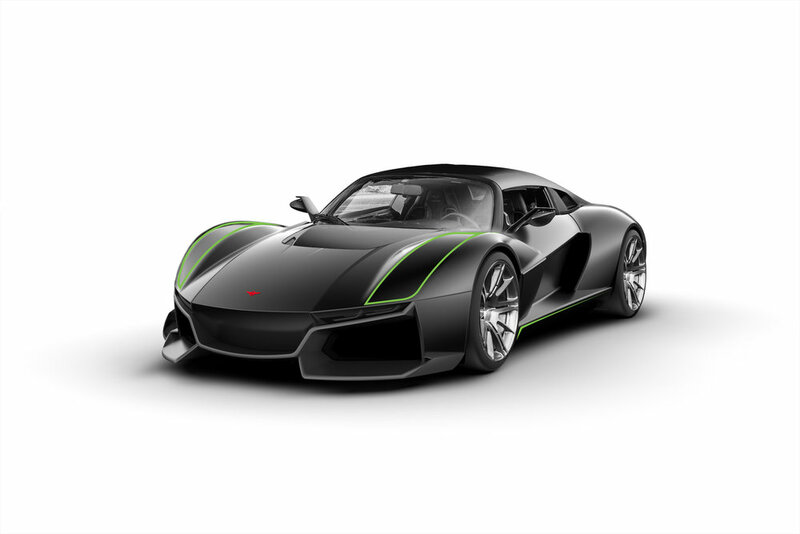 A composite material used in aerospace and Formula 1 racing, carbon fiber Construction allows Beast to be one of the lightest sports cars in the world, and is critical to Beast's handling and race car driving dynamics. Beast Alpha's body is made entirely of carbon fiber.